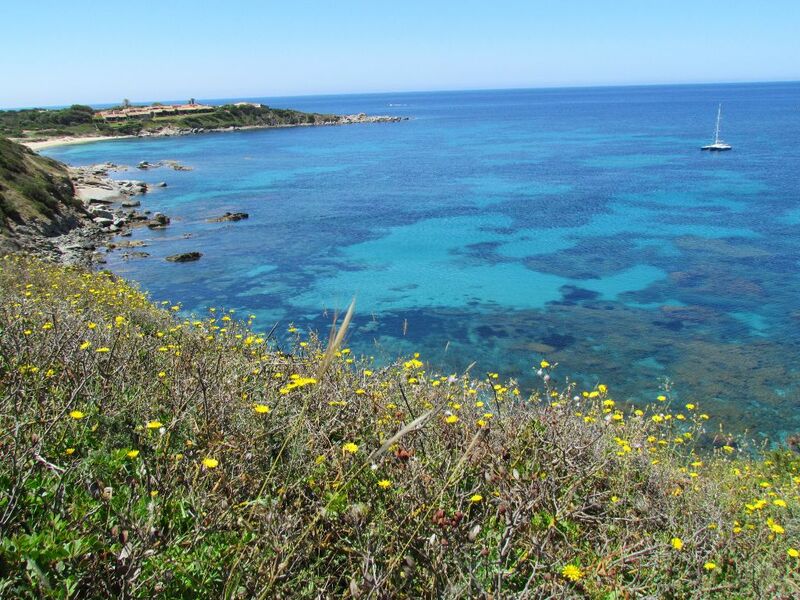 Cabo Carbonara / Villasimius provides a choice of anchorages on the east or west side, depending upon the wind direction. We were there for well over a week but we were in no hurry and it was a lovely place to be stuck. After our passage from Sicily we spent a few days chilling. Then we both succumbed to the Palermo Plague (so named as we reckon we caught it during our visit to Palermo) which knocked us out for a few days. We then wanted to explore the area and have a few walks and by the time we’d done that, strong NE winds arrived that prevented our progress north and kept us pinned down for two more days. The west anchorage has good holding and has the advantage of easy access to the marina where we could securely leave the dinghy and make use of the facilities. The washing machines were put to good use as we still hadn’t got our water maker running yet. 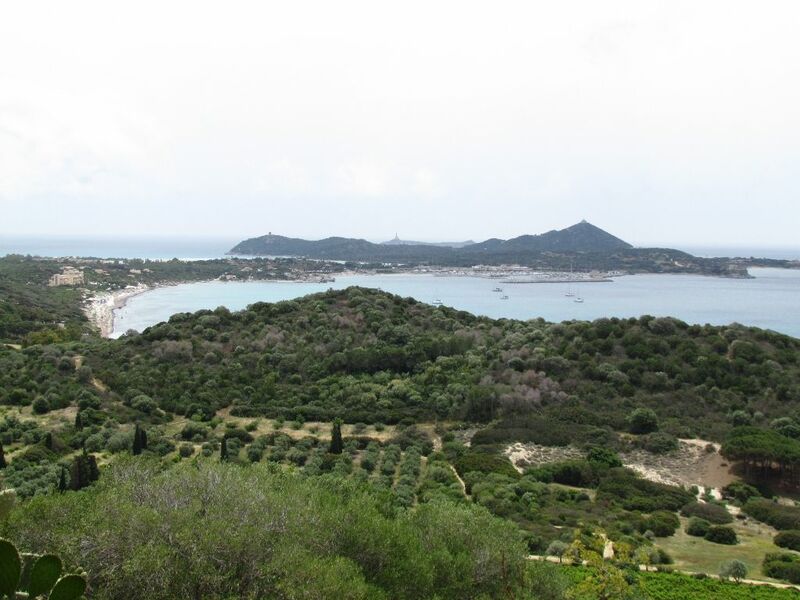 Villasimius is the largest nearby town, hidden from the coast in a dip in the hills, about a two mile walk from the marina along a footpath. It seemed a pleasant place with tourist shops and cafes, small produce shops along with two big supermarkets (Conad and Eurospin) on the outskirts. And lots of ice creams shops! There are several holiday resorts, hotels and campsites in the area but all were low key with no high rises to affect the scenery. The area is beautiful with clear water and white-gold beaches backed by green hills with craggy granite tops. 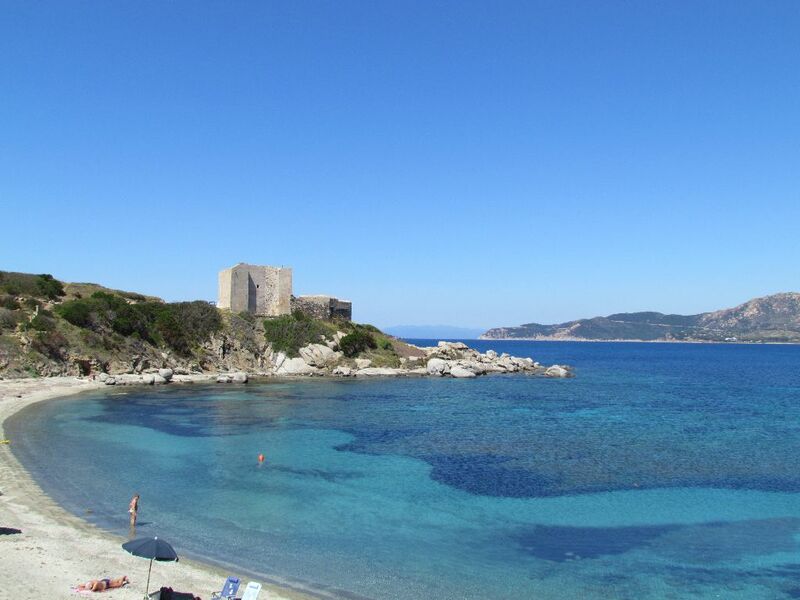 Cabo Carbonara itself is a narrow finger of land pointing SE with sandy beaches and rocky coves on either side. 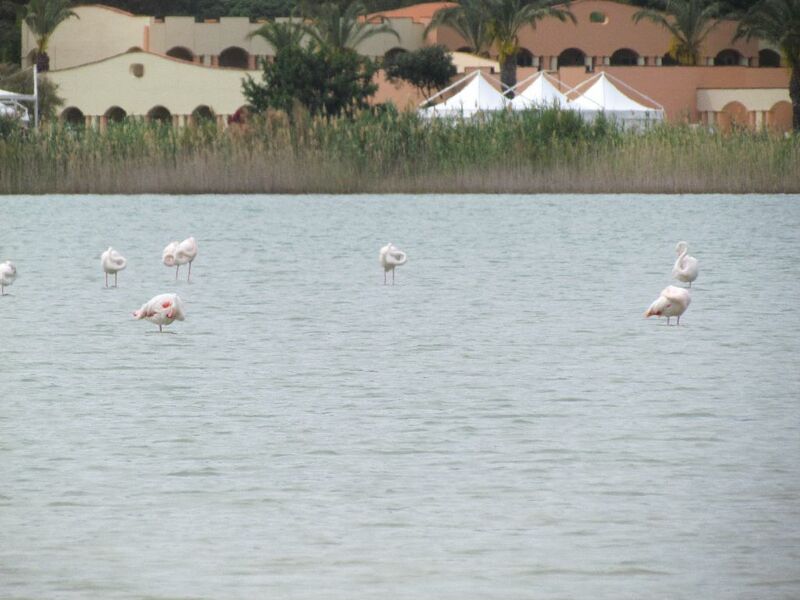 Behind the eastern beach is a lake, the home of a few flamingos. We took a walk around it although the grounds of a hotel run up the northern edge, however, we walked through them and nobody bothered us. The walk out to the cape is lovely, mostly on sandy tracks with interesting things to look at along the way. A wide, sandy track runs part way along the headland, then look out for a narrow footpath branching off that heads uphill. It looks like horses have also used the track. The spoils of an old quarry have provided the building blocks for cairn building on the beach below the watchtower. We added our own creation to the many that were already there. All along this coastline are the remains of watch towers from the Spanish occupation of the island in the 15th and 16th centuries to defend against raids from the Arabs. They are now ruins but there are stunning views from them. 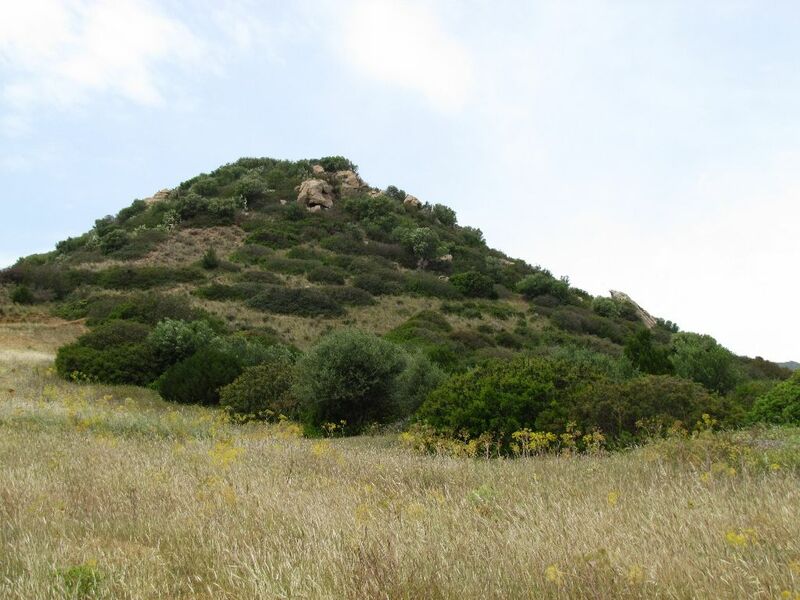 Nuraghes are prehistoric monuments that dot the landscape of Sardinia and are supposed to look like conical towers. Looking on Google Maps, there were two close ashore near the western anchorage. 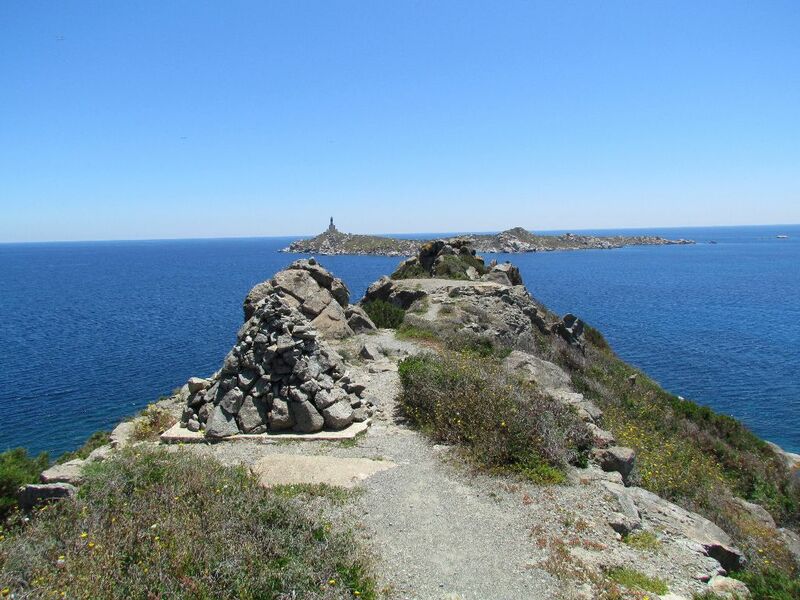 Being a fan of old bits of stone, I decided to go on a nuraghe hunt and plotted out a route that would take us along the beach where we should then find a track to take us to the first of the nuraghe. So, on a cloudy morning we set off on our expedition, first along the white sand beach, past the sunbathers from the hotels and right to the very end. There we found the track we wanted was closed off by a very high fence and “no entry” signs (written in Italian but pictures speak a thousand words). Not to worry, we decided to try out luck going around the coast which had now turned from sandy beach to a rocky shore with large boulders and small cliffs to traverse. 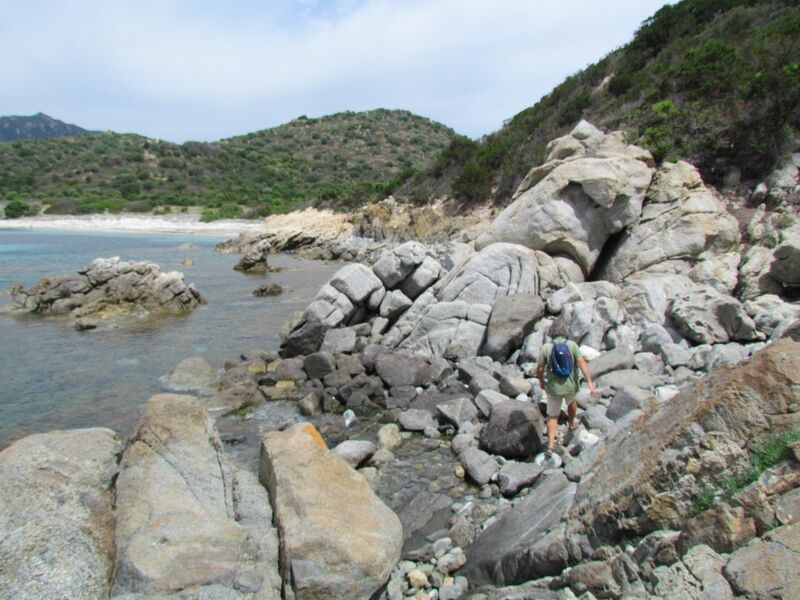 It was a fun scramble around the headland where there was a small beach; the map showed a track behind the beach which we soon found and headed along past cultivated rows of grape vines and olive trees. The cultivation should perhaps have been a clue to what came next. Turning a corner we were faced with another big fence and a high gate to boot with security cameras stuck on top. It looked impossible to climb, so spotting a track running up a hill we took it to see if we could see another way out from the higher vantage point. We did, but it involved a hop over a barbed wire fence and a short hands and knees scramble up a rocky slope with only spiky bushes to get a hand grip on. Another track was there and we followed that down to the road that would take us back to the anchorage. Only in our way was yet another high gate. This one thankfully had only a wire hook keeping it closed and we were happily soon on the road. Thank goodness there were no dogs like we’d have been bound to encounter if this had been Greece! And the nuraghe? An overgrown jumble of rocks that looked like a tor that you might see on Dartmoor. And we guess the landowners don’t want visitors! Having taken the watermaker (a Katadyn Powersurvivor 80) out of it’s winter sleep back in Taormina with no problem, the next day when we went to run it, it kept switching itself off after only a few minutes of running and the motor was really hot to the touch. With the assistance from Jim at Mactrashop in the UK we ran some tests and flushed some cleaning chemicals through it. Thankfully the motor itself seemed to be OK with no sign of any oil leaks, so the thinking was that the membranes needed a clean with the alkali and acid chemicals. We didn’t get the time to do this so had pickled it again until our arrival in Sardinia. With lovely clean and clear water around us, we were in a great spot to run some more tests. In the meantime a suggestion had been made that the breaker switch might be on it’s way out and dropping the voltage, causing the motor to have to work harder and ultimately overloading. We had an epiphany when we remembered Colin had put a hour meter in line with the power switch so we would know how long we ran the watermaker for. The meter had turned out to be not working (a cheap Chinese made item) so could this be the source of the problem? It was removed from the circuit and lo and behold the watermaker ran fine. It was such a relief. The watermaker is a costly item to have to replace parts with the added woe of where we would get parts delivered to. Happy days. When the wind blew from the west, the west anchorage became very uncomfortable so we motored around to the east side. Although there was good holding and shelter from the wind, some swell crept around the corner. We didn’t go ashore from there but it looked like there was a concrete quay in the cove below the watchtower. Landed the dinghy in the marina which has most facilities – laundry, boatyard, cafe, small grocery store. Although we failed to find a chandler to buy a Sardinia courtesy flag. Fuel is expensive in Sardinia! Diesel was listed in the marina at 2 euros per litre. 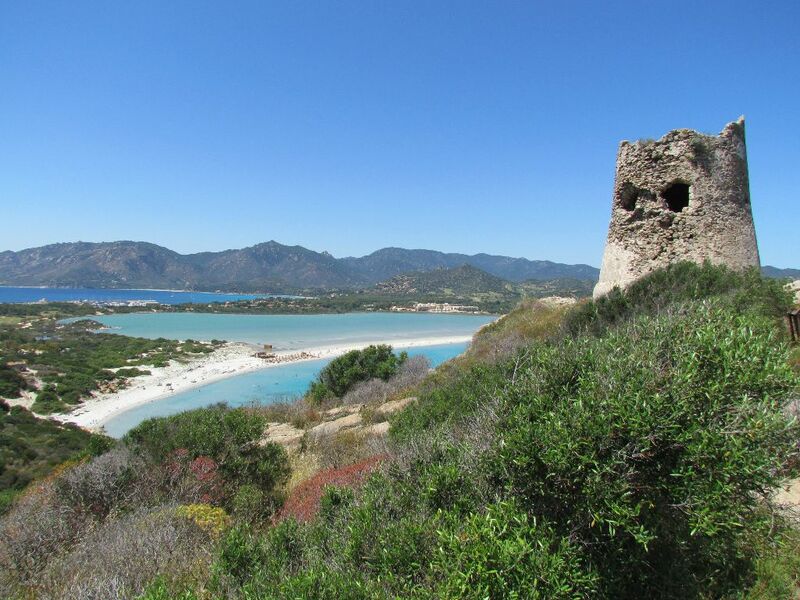 ← Sailing to Sardinia – Our Best Passage in the Med?